Well, we did it. Sort of. I mean, we've been doing it all along. It's part of our essential philosophy. But now we sort of mainstreamed it. What am I talking about? Hot water. More specifically, the way we get the water hot. When we first moved into this old building more than eight years ago, we knew that every element of the major systems--heating, hot water, electric, plumbing--would need to be replaced at some point, probably sooner rather than later. When we had the oil-fired forced hot air system serviced for the first time, one of the technicians glanced over at the hot water heater and said, "That thing's on its way out. You better think about getting it replaced before it fails." Since we were dirt poor, we laughed off his suggestion, went to bed, and prayed that the hot water heater wasn't on its way out for a few more years. A hot water heater is nothing more than a big tank--30, 50, or 60 gallons--that simmers your water at a temperature between 120 and 140 degrees. Hot water heaters accomplish this by burning oil or gas, or with electrical heating elements. The premise of this system is so wasteful that it calls into question our right to be have the word sapiens in our taxonomic name--there's not a lot of thinking required for this system, just waste. I'm not going to get into the math--someone else can post the numbers in a reply to this blog--but think about it: how much energy does it take to sustain 30 gallons of water at 120 degrees, twenty-four hours a day, seven days a week, forever? And why do we keep these tanks simmering? In hopes that somewhere, sometime, in the course of the day, someone will need some hot water. Maybe someone will fire up the dishwasher. Or maybe someone will wash some clothes. But the main purpose for all this energy being pumped into water tanks is so that we can take a nice, hot shower. Mmmmm. The way to overcome this is with point-of-use hot water systems (also called on-demand hot water, or tankless hot water). With these systems, when someone opens a hot water tap, the heater fires up, heating the water instantly and feeding it to the point of use. When the hot water tap is closed, the heater stops burning fuel. And if you don't burn it, you don't use it. And if you don't use it, you don't have to pay for it. In the meta-sense of that thinking, if we're all burning less fuel, we all have to rely less on unpleasant things like oil from the Middle East or drilling in sensitive areas. Go ahead, try that line of thinking. Earn your title as a thinking being. Oh, and that hot water heater that the technician told us was on its way out? More than eight years later and it was still simmering away. It was also doing a nice job of heating the basement, but that's another story. Last week we finally parted ways with that old hot water heater, and we installed a new Rinnai tankless system. I'm not sure how much money we're going to save on our propane bill--we have a lot of other appliances running off propane, like the stove, a fireplace in the guest living room area, and the heating system for the other side of the inn--but we'll save enough to pay for the system (which cost about $2,000 to purchase and install) in a couple of years. If there's one downside to the system, it's that it takes about thrity seconds for the hot water to reach the tap. 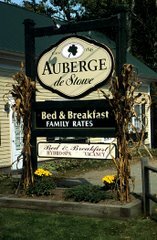 So though it may be a small step by a small user, it's a positive step nonetheless, and it's something we can talk to our guests about here at the Auberge de Stowe Bed & Breakfast. And maybe some of them will be inspired to go home and do that same. I'll admit that sometimes I like to sneak into the breakfast room and fill my coffee mug and retreat to my office. That's because I'm in the middle of some early morning writing project, and I don't want to interrupt the mojo. But once in a while I hear something that stops me cold, and this morning was one of those times. As I was tiptoeing through the lobby, I hear a woman, one of our guests, talking to Chantal, my wife. She said to her, "Thanks again for helping my husband with his pants." I know what you're thinking; I had the same thought. But there's a bigger story here, one worth hearing. Last night, in the middle of dinner, we had a check-in. We always have check-ins in the middle of dinner, so this wasn't news. The folks checking in were a woman and her brother-in-law. They were supposed to meet the woman's husband here, but the husband was delayed. Finally, a couple of hours later (now it was well after 9 p.m.), the husband showed up. He was covered in mud and he smelled like a swamp. It seems he was on his way here when he saw a car accident. Because he's a member of a National Guard unit and trained in emergency services, he stopped to help, eventually performing CPR on one of the victims. Now he stood before us, dripping and stinking. He quickly changed a pair of light sweatpants, and asked if we could do something about his pants. They were the only pair he'd brought with him, and they would be unusable tomorrow when they left. So Chantal washed them for him at 10 p.m. It wasn't something she wanted to do, but it seemed like the right thing to do. The next morning the pants were clean and dry, hence the remark by the wife that she was happy Chantal helped her husband with his pants. The line reminds me of the things heard in bad sitcoms, and I guess this is where they get there start. But I think from now on I'm not going to sneak around to get my coffee.